Alexandrite is a very rare and valuable gemstone. It is a colour changing gemstone and known to be called 'emerald by day, ruby by night' - making it great for jewellery designs! Shop our range of cabochons, faceted stones and beads below. Alexandrite is such a rare and unique gemstone which is adored for its changing of colours. The stone, alexandrite is a variety of Chrysoberyl and is named after Czar Alexander II of Russia. The colours range from green, blue, red to purple. Alexandrite is mined mainly in Russia, but also in Sri Lanka, Madagascar, India, Brazil, Burma, Zimbabwe and Tanzania. Alexandrite measures 8.5 on the Moh's hardness scale. The birthstone of June is Alexandrite, making this a very special gemstone to use in beautiful birthstone jewellery. 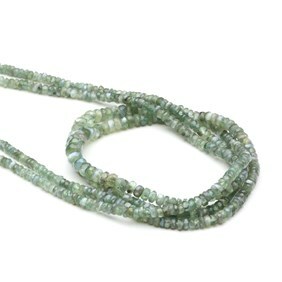 We absolutely love our Alexandrite rondelle beads which sparkle beautifully in the light. We also have many limited edition stones of one-off individual gems for those special designs. Shop our range of beading threads and jewellery findings to use with our gemstone beads. We also have an extensive range of silversmithing supplies for all your needs. Explore our beginner's jewellery making kits with step by step instructions for inspiration or check out our jewellery making tutorials on silversmithing, wire-wrapping, beading, stone setting, texturing and more. Alexandrite is believed to be a stone of prosperity and longevity, thought to balance the mind, soothe the soul and promote spiritual growth.